Jonathan Hunt, who oversaw the first crop for the Flandreau Santee Sioux Tribe, pleaded guilty to a drug conspiracy count in the city of Flandreau, which is adjacent to the tribe’s reservation where the ambitious “adult playground” never took off. Eric Hagen, the CEO of the Colorado-based consulting firm Monarch America, pleaded not guilty to charges of conspiracy to possess, possession and attempt to possess more than 10 pounds of marijuana. 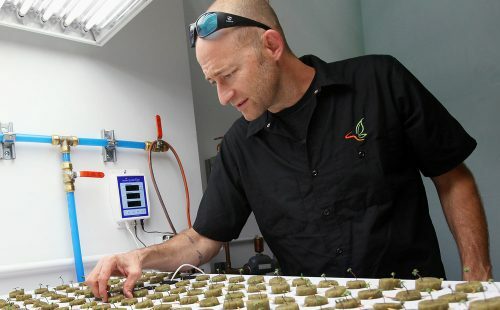 The charges were filed Aug. 3, eight months after tribal leaders destroyed the marijuana crop, fearing a federal raid, and walking away from the headline-grabbing scheme that they estimated would have yielded up to $2 million in monthly profits. Butler said he will call tribal officials to testify in court. Hunt and his attorney declined to comment to The Associated Press on Monday. Hunt is to be sentenced Dec. 19, though the date could change depending on Hagen’s case. The prosecution recommended probation. The tribe’s attorney, Seth Pearman, said tribal officials are not commenting on the cases at the moment. No tribal officials are charged. Court documents say Hunt ordered 55 different strains of marijuana seeds from a company in the Netherlands that were put in CD cases and sewn into shirts and shipped to the tribe’s office in August 2015. Authorities say Hunt and others planted about 30 strains in September and October at the greenhouse on the reservation. Authorities allege that Hagen conspired to possess, possessed and attempted to possess the marijuana plants that were being grown at the greenhouse. The ambitious plans included a smoking lounge with a nightclub, bar and food service and, eventually, an outdoor music venue. Tribal officials planned to use the money for community services and to provide income to tribal members. But weeks after the growing operation took off, the crop was burned in batches — about 600 plants in all — after federal officials signaled a potential raid. Jackley warned against the idea from the outset, saying changes in tribal law to permit the operation wouldn’t protect non-tribal members. Hunt is not a member of any recognized tribe in the U.S.